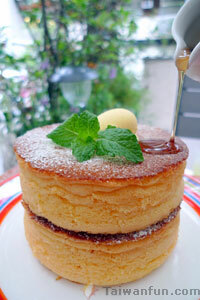 In 2004, Ms. Katosaki Kyoko opened Uzna Omom Harajuku Pancake in the so-called "Cat Street" Ura Harajuku District in Tokyo, Japan. Using her exclusive recipe, she created pancakes that had the Japanese people praising it as fuwa and mochi (meaning fluffy and chewy in Japanese). Specialized in coming up with new flavors using various sauces, this little restaurant unexpectedly started the Cat Street Pancake Trend in 2005. Now taking one step further in opening its first branch overseas, at the fashionable East District of Taipei. Are pancakes just breakfast or desert? One can not only order pancakes any time of the day at Uzna Omom Harajuku Pancake, he or she can also have it as a whole meal. So besides the signature Apricot Mascarpone Pancake, the Thick Souffle Pancake that's only available in Taiwan is also a must-eat. If one's hungry, don't forget Ms. Katosaki's selection of the four most popular savory pancakes at the Harajuku headquarters, such as the Parmesan Prosciutto Whipped Cream Pancake (NT$330), and the BLT Salad Pancake (NT$290). Regardless of sweet or savory, all pancakes come with one drink that's under NT$160. Besides coffee and tea to choose from, one can also enjoy red or white wine without additional cost. A. To commemorate the first branch abroad, Thick Souffle Pancake (NT$250) is a pancake Japanese people would have to fly to Taipei for. In order for Taiwan to ride with the latest Japanese thick pancake trend, Ms. Katosaki Kyoto specially came up with the four centimeter tall pancake. A serving comes with two pieces, measuring in at a total eight centimeters tall, making it the thickest pancake in Taiwan. Despite the complex and meticulous baking process, the taste is straight-forward and simple. Similar to an oven-fresh "chicken-shaped cake", one can enjoy it with some butter or maple syrup. B. Apricot Mascarpone Pancake (NT$250), with the apricots looking so appetizing, it is Ms. Katosaki 's first special flavor. Using wheat flour from Hokkaido and local country eggs from Miaoli, the batter is made with precision. The first overseas branch in Taipei even imported a steam-type stove top, allowing heat to be evenly-distributed, which further stabilizes the quality of pancakes. Pancakes that are made this way will still be fluffy and spongy instead of gooey. One can taste different flavors by dipping it in mascarpone, Hokkaido whipped cream, or apricot sour cream. C. Not only does Uzna Omom Harajuku Pancake offers various kinds of sweet and savory pancakes, it also provides many variations of light meals. The satisfying Red Wine Braised Beef in a Bread Bowl (NT$310) contains a generous amount of red wine braised American short ribs, mushrooms, and broccoli, baked with a layer of cheese; one can enjoy dipping the bread in the sauce and the salad that comes with it. D. Shizuoka Matcha Latte (NT$180) Make your own matcha (Japanese green tea). The waiter will bring the matcha powder, hot water, hot milk, and brown sugar to the table and explain the steps. One can add water and milk according to one's taste. E. As a result of Ms. Katosaki's artistic personality, there are often exhibitions of the newest paintings and literature works. To further this distinguishing feature, the art works this first branch overseas displays are the ones Ms. Katosaki wishes to introduce to friends in Taiwan.